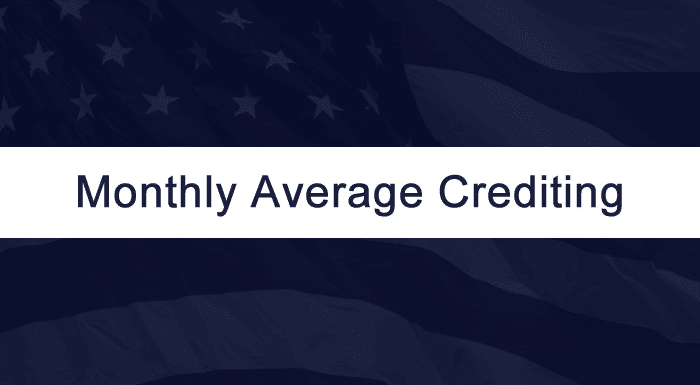 As we continue our series on retirement annuities, we will now explore another crediting method which is called monthly point to point, also known as monthly average crediting. As a reminder, there are three types of market index crediting methods used in Fixed Index Annuities – Point to Point, Monthly Sum, and Monthly Average. Your contract may have variations of one, or all three available for you to choose from. In monthly average crediting, the insurance company records the value of the index you’ve chosen to track once each month. This snapshot of the index is taken on the day-of-the-month your contract was issued. At the end of the contract year, they take an average of the monthly values, and then compare it against the index’s value seen at the beginning of the contract year. 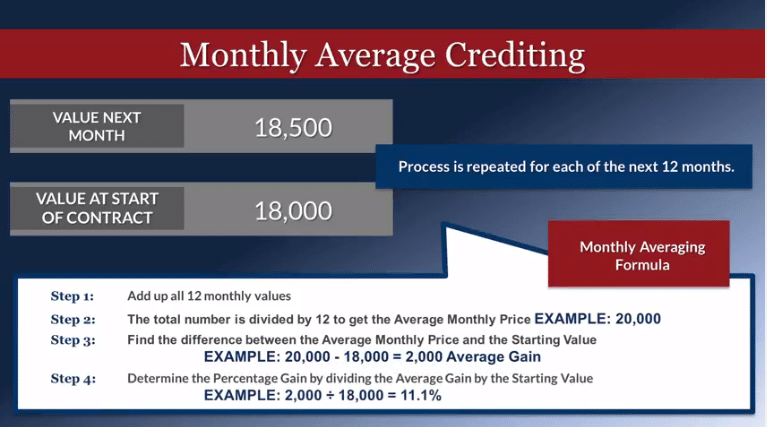 Here is an example of the Monthly Average crediting method for fixed index annuities. Let’s say the Dow Jones Industrial Average on your first day started at 18,000. The next month, the Dow is at 18,500. The insurance company will record that value. They will continue doing this for twelve consecutive months. At the end of those 12 months they add up all of those 12 monthly values, and divide by 12 to get the average monthly price. In our example, the average monthly value of the Dow is 20,000. Some companies have an annual cap on this strategy. For example, if the cap is 7%, and the average value was up 11.1%, you would be credited with 7%. However, some companies don’t apply a cap to the monthly averaging strategy, which can mean higher potential earnings. In this case, they apply something called a spread. Instead of placing a limit on what you can earn, the spread is deducted before your earnings are credited. Let’s say the spread is 2% for the contract year. If in our example the average gain was 11.1%, you would be credited with 9.1%. If you haven’t already, I invite you to read our blogs on Point to Point, and Monthly Sum Crediting so you will have a better understanding of the options that are available to you. An even better option would be to sign up for our free video series on fixed index annuities. Simply click the banner below and gain instant access to our videos to view at your convenience. The crediting methods you select can have a big impact on your Fixed Index Annuity’s performance. That’s why it is so important to deal with a financial professional who can guide you through the different crediting methods available in your contract, and help determine what might work best for you.